My sister gave me some of her old hoop earrings and I decided they would make some nice bangles. I didn't have beads big enough to thread through the bangle itself, so I decided to make some some charms instead. 1. Thread a bead of your choice through an eye pin. 4. Open some jump rings and thread them through the loops you just made. One jump ring for each loop. 1. Thread your second bead of choice through a head pin. 3. Open a jump ring and thread it through the loop. Close the jump ring. Continue making these charms using the same steps. I made 8 star charms and 5 gold bead charms. 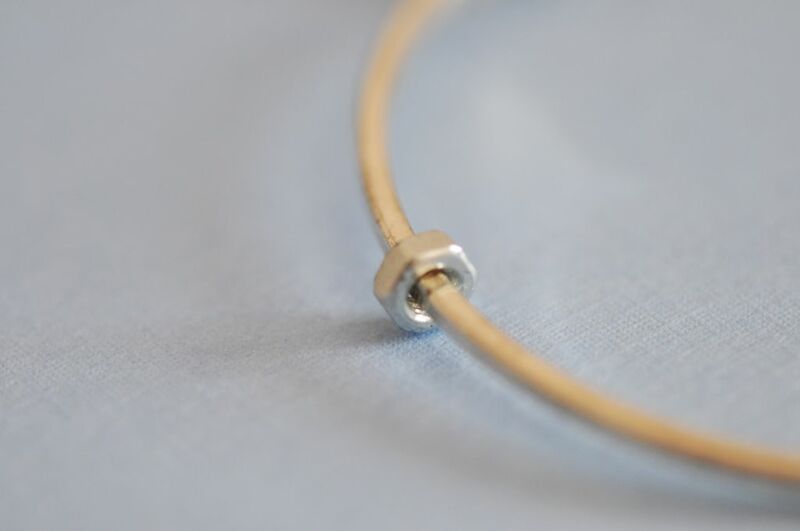 Thread your mini hex nut through your bangle and then thread all your charms in the order you would like. 4. Repeat steps 2 & 3. After letting all the glue dry, you're done! You've transformed your hoop earring into a nice bracelet.